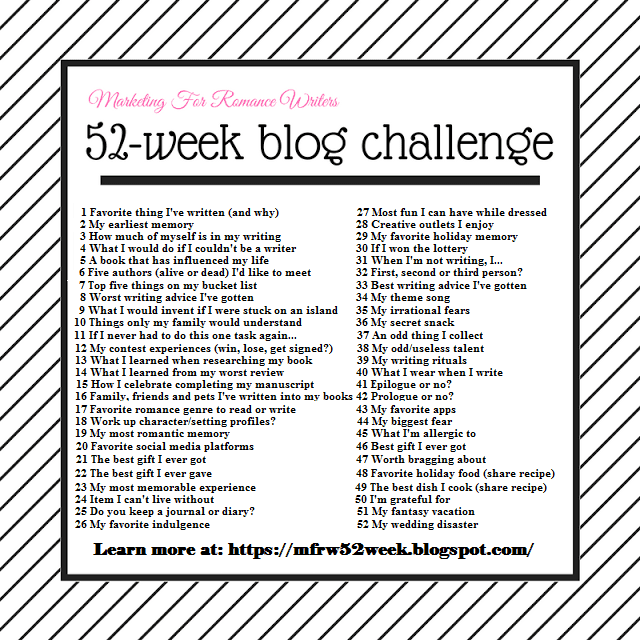 It is time for week 8 in the 52week MFRW 52weekblog challenge. This week’s topic is The Worst Writing Advice I have ever received. This was really hard one for me. I had thought a while. I almost decided to say I couldn’t think of anything when I remembered this tidbit… Write only what you know. I am not a traveler. As a matter of fact, I am a recluse. I have held like four jobs in my life counting the two when I was a teenager. I have lived in three states two for about a year each. The only holidays I had were as a child we went camping..pretty much to the same places every year. So my life experience though I am 56 is slim. If we only wrote what we knew there would be no science fiction. How many of us are aliens or rocket scientists or flew to the moon, lived on other planets. How many of us fought in world war 1 two or civil war… Or lived in the wild west so we could write historical? How many of us are pirates? Vampires? werewolves? Fairies? witches..mages demons? I think you get the point. If we all wrote only what we know some of the best books wouldn’t exist. The internet opens up so many worlds for us. Good research lets us become one of the things I mentioned above so we can write amazing, realistic stories! So, yes this advice I threw right out the window! Does this mean I don’t use some things I do know to enhance my stories? sure I do. I have plenty of crafting, cooking and other things that do help to make my characters real, but this experience is limited and would mean no writing for me. I think writing is like living a dream. If we can dream it up we can write about it. What’s the worst writing advice you have ever had? Do you believe in write only what you know? Let’s go see what the other author’s worst advice is? That’s a great interpretation MIsty I do write things I know into my stories the way you worded it LOL. I bend mosy advice to suit me or I discard it. There is definitely a lot of ‘advice’ out there and write what you know messed me up for a long time. It was one of those that blocked me for a long timr until I modified it to fit my needs. Yeah I have learned to take some advice with a grain of salt or to bend it to my needs lol. I don’t believe in writing “only” what I know for the reasons you stated. I think we add what we know to our writing when we don’t realize we do it. Great post, Cathy. That’s a great interpretation. That I can do. Very true. Some of the statements like this one, it makes me wonder how and why they got started. Exactly If we didn’t go out there-there would be no paranormal stories, no Sci-fi, and no historicals. I totally agree that if we can dream it we can write it. Great post! However, I always looked at that little nugget as ‘do your homework’, then write about Regency London or Tudor France. 😉 Thanks for sharing! That’s a great way to take the advice.I too do my homework. Its great we have the web at our fingertips. Love your post! I never did cotton to that advice, at least taken at face value.